More than 1 million people were under mandatory evacuation orders that went into place at varying times in the days before the storm hit, but many others chose to stay put and ride it out. Florence was registering as a Category 4 storm earlier in the week but has since been downgraded to a Category 1 storm. Residents throughout North and South Carolina, where the heaviest impacts of the storm are expected to be felt, have hunkered down and documented their experiences. Here is a collection of some of the best videos on social media showing the effects of Hurricane Florence. Belhaven resident Ben Johnson posted an update from his porch at 9 a.m. Friday, showing high flood waters near his home. The water was clearly several feet high and had, according to Johnson, "busted open" several doors. "We're all safe and sound and good as we can be, so we'll assess the damage once these waters recede," he said in the Facebook video. In another video from this morning, Johnson compared the damage to what he has seen in other storms. "This is the highest I've ever seen it -- Floyd, Irene, Isobel, Bertha, Fran, Bonnie, Dennis," Johnson said while filming from his home's upper deck. "I've seen stronger winds for sure. I've never seen this relentless push of water like this is," he said. 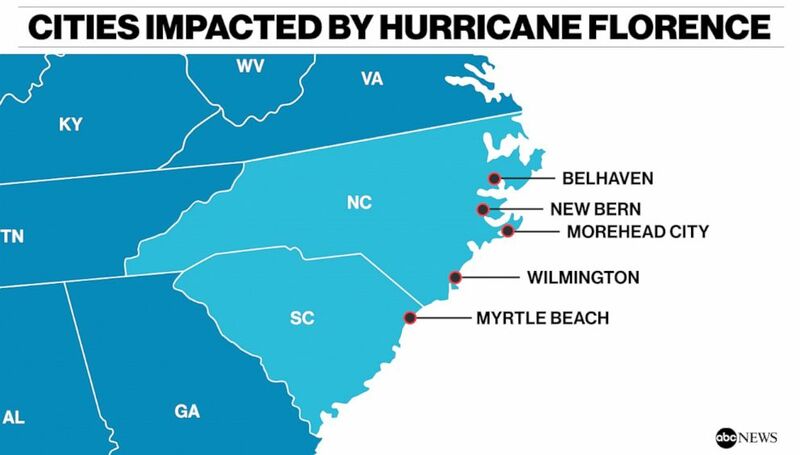 Part of the threat posed by Hurricane Florence is that it is expected to be a relatively slow-moving storm, lingering in areas and dumping large amounts of rain. Instagram user @CaptCarcajou acknowledged in one post this morning that he was waiting for the expected storm surge, which could prove problematic in the coming hours. Several feet of floodwaters and steady wind and rain can be seen in another video from New Bern. Downed trees seemed to be some of the earliest signs of the damage in Wilmington. Instagram user Catherine Henning realized she was lucky that she didn't park her car near one such tree. I almost parked my car there ???????? Another resident noted that she was lucky that a tree missed her house when it fell. One local man took the time to capture one of the storm's lighter moments during an otherwise tense time. This just in: Local tree uproots to reveal local man who had been trapped in it's root system for decades. ????? ?